Marios Menelaou was born and raised in a tiny Mediterranean island, Cyprus. Laying in the crossroads of three continents, Africa, Asia and Europe, he has been influenced since young age to a variety of musical traditions. At the age of 13, he was introduced to guitar and later on, at age 16, fell in love with the bass guitar. He started studying intensively with famous Giannos Savvides as well as following jazz workshops and private classed from New York musicians Ari Roland and Chris Byars. In 2010, Marios moved to the Netherlands and studied Bass guitar in the Conservatory of Amsterdam. There, he learnt new techniques with professors Charty Angenois, Theo de Jong, David de Marez Oyens and Lene te Voorwis . 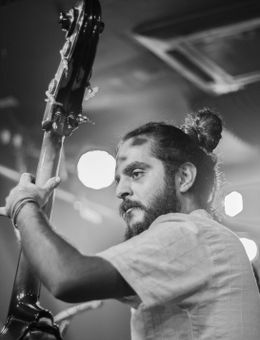 Beyond jazz bass guitar, Marios also studied four years Karnatic techniques on improvisation and composition. In his years in Amsterdam, Marios was influenced and fused music from jazz, middle eastern music and african music. In 2015, he was awarded a scholarship at ISI Despensar University in Bali Indonesia where he studied Balinese Gamelan and became a gamelan player. On his musical journey, Marios met a plethora of genres and musicians and he performed in many festivals such as the Afro Vibes Festival in the Netherlands, Aglagazz, Feggaros in Cyprus and many others in Europe. In the Netherlands, he has been the founding member of Astrophunk and back in homeland Cyprus, he co-founded the jazz trio Lp3 where their first album “The underdog” was released in November 2017. Teaching has been an integral part of this journey : he has been providing private lesson in bass guitar, music theory, harmony and ensembles. Has has also been a teacher in the National Conservatory of Cyprus.